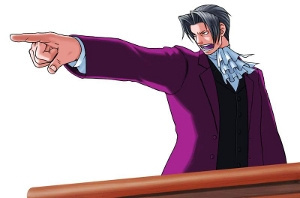 "You will buy my game"
Ace Attorney Investigations: Miles Edgeworth will be released in Europe on 19th February, Capcom announced. Miles Edgeworth is the next game in the Ace Attorney series, which won't be focusing on Phoenix Wright, the main protagonist of the whole series. The story goes that Miles, upon witnessing his father's death and watching in horror as the suspected murderer was let free, gained a hatred for criminals and began studying to be a prosecutor, learning tactics from his mentor Manfred von Karma on how to always get a "guilty" verdict. This game is a standard "point and click" adventure, with the player controlling Edgeworth's movements and what he interacts with. For each case, the goal is to collect evidence to determine who the perpetrator is, how the crime was committed and their motive. The game features five new cases. I've heard good things about the Ace Attorney games. Maybe this will be my first one? pixelman, beside your stealth firstie, that is exactly what I was thinking as well. Edit: Then again, I don't live in Europe. Anyone know what the North American release date is? @PhoenixSage: Haha, I've had a lot of those lately. Ahh, okay. Thanks, Giggsy. Hopefully I'll have some extra money around that time, but who knows. With all the games coming out in 2010 that I want I'm going to be hard-strapped for cash. Which is a good thing, but still forces me to make decissions. @pixelman: I think it's because your a pixel ninja, myself. Yeah, pixel ninjas get all the stealthy firsts. EDIT: Wait, I thought this was a Wiiware game. Guess I still haven't gotten used to the change yet. I probably won't get this one, either. If anything, I might try to find the first one cheap, but otherwise this might be one of Capcom's few series that I never got into, even once. I definately recommend the entire series to anyone who has a DS and likes a good story and a game that makes them think. I'm still rocking up the third game currently I am still not sure what to think of this though. I will give it a go anyway. 3 days after America. I can live with that. This seriously may be my first one also. @Mayhem: Oh, I thought they were just being nice this time. I can't blame them, I imported every game after the first. Definite day 1 buy for me, then I'm going to get nagged by everyone else to finish it quickly so they can play through it. @ Big A2 - there have been big gaps between US and European release dates in the past, so people import. This time the gap between Japan and US release dates is a lot wider than before... QED.